Melt the butter in the belly of a stove-top safe slow cooker insert or in a large pot. Liberally season the beef with the salt and pepper and then, working in batches so that you don’t crowd the pan, brown the beef for about 3 minutes on at least 2 sides, or until the beef forms a nice deep brown color. Transfer to a separate bowl and continue to brown the rest of the beef. Once the beef is finished browning, add the onions and garlic to the pan with the beef drippings and remaining butter. Saute for 5 to 10 minutes, or until the onions are translucent and the garlic is fragrant, but not burned. Add the beef back in along with the rest of the ingredients, save for the lemon and parsley (we’ll add those at the very end). 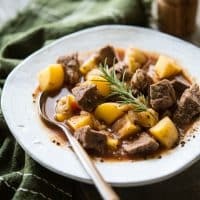 Place the rosemary on top of the rest of the ingredients and cook on high for 4 hours or on low for 8 hours in the slow cooker. Just before serving, mix in the fresh lemon juice and any additional salt you think it may need. Serve in individual bowls and garnish with a fresh sprig of rosemary and fresh cracked black pepper, if desired.